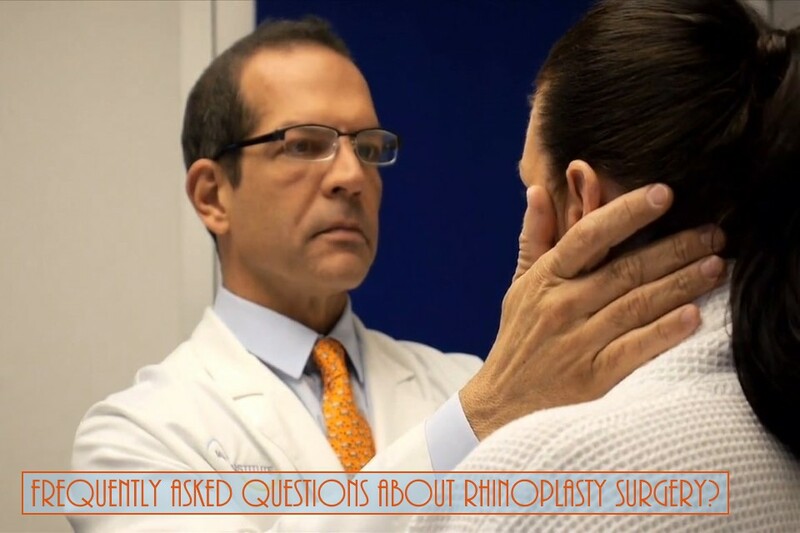 Do you have questions about your Rhinoplasty Procedure? Well you've come to the right spot, here is our list of every question about Rhinoplasty Procedures we could find. How long should I wait after my Rhinoplasty before I get a Revision Rhinoplasty? A: Rhinoplasty, commonly known as a nose job, is a plastic surgery procedure for correcting and reconstructing the form, restoring the functions, and aesthetically enhancing the nose by resolving nasal trauma, congenital defect, respiratory impediment, or a failed primary rhinoplasty. Most patients ask to remove a bump, narrow nostril width, change the angle between the nose and the mouth, as well as correct injuries, birth defects, or other problems that affect breathing, such as deviated nasal septum or a sinus condition. Q: What are the different types of Rhinoplasty procedures? A: Reduction Rhinoplasty - Commonly known as a nose job, Reduction Rhinoplasty is a plastic surgery procedure for correcting and reconstructing the form, restoring the functions, and aesthetically enhancing the nose by resolving nasal trauma, congenital defect, respiratory impediment, or a failed primary rhinoplasty. Most patients ask to remove a bump, narrow nostril width, change the angle between the nose and the mouth, as well as correct injuries, birth defects, or other problems that affect breathing, such as deviated nasal septum or a sinus condition. Augmentation Rhinoplasty - A cosmetic surgery procedure performed to increase the size of specific parts of a person’s nose to give it a more aesthetically pleasing appearance. The procedure, among others, can add height to the nose bridge or alter the shape of the nasal tip to increase its projection. Post-Traumatic Rhinoplasty - A procedure to address injuries to the nose that can lead to damaged airways, deformation, broken bones, and lost cartilage support. The most common causes of these injuries are usually a result from sports injuries, car accidents, and fights. Reconstructive Rhinoplasty - Following surgery to remove cancer or occasionally following facial trauma, the nose may be left severely disfigured due to the lack of tissue that has been removed or lost. Reconstructive Rhinoplasty refers to surgery required to restore tissue that is absent or has been damaged beyond repair. Surgical repair requires the use of grafts and flaps from various parts of the body to restore the missing component tissues. Ethnic Rhinoplasty - A nasal surgery where the nose is surgically altered to create a symmetrical, aesthetically pleasing nose that suits the individual patient’s face without diminishing the patient’s ethnic characteristics. Refinement Rhinoplasty - Complaints about the nasal tip rank among the top reasons for rhinoplasty surgery. Many patients are unhappy with the way their nose points up or down at the tip, how bulbous or round the tip appears, or how pointy the tip is. Refinement Rhinoplasty can involve various tactics to fine-tune the nasal tip in a more pleasing fashion, one that complements the other features of the face. Your surgeon may add or remove cartilage and tissue in order to perfect the tip’s shape or direction. Revision Rhinoplasty - A surgical procedure designed to repair both form and function of a nose that has previously been operated on. Many people have difficult breathing from their nose or are dissatisfied with the cosmetic appearance of their nose as a result of prior nasal surgery. Septoplasty - A surgical procedure that’s done to fix a deviated nasal septum. The septum is the wall of bone and cartilage that divides your nose into two separate nostrils. A deviated septum occurs when your septum is moved to one side of your nose. Some people are born with a deviated septum, but it can also be caused by an injury to your nose. Turbinoplasty - A procedure to decrease the size of the turbinates. In short, turbinates are structures along the side wall of the nose that can swell and cause obstruction. By reducing their size, your breathing can be improved. Alarplasty - A procedure where the sides of the nose at the bottom which are referred to as the alar are reshaped. In most cases this involves narrowing or reshaping the nose to improve the balance in relation to the base and the other structures of the nose. Q: How costly can a Rhinoplasty procedure get? A: On average, the surgeon’s fee for rhinoplasty is between $3,500 - $8,000. This amount does not include the facility or anesthesia fees, or additional expenses that may be required for patients undergoing rhinoplasty. The anesthesia costs are usually between $600 and $1,000, and the facility fee between $700 and $1,100. The total cost of rhinoplasty usually averages between $5,000 and $12,500. Q: Is Rhinoplasty covered by health insurance? A: If you have had a significant nasal trauma in the past, it is possible that insurance may cover corrective nasal surgery for breathing and appearance. However, in most cases, insurance will not cover rhinoplasty to change the appearance of your nose, especially if you have no history of trauma. Q: Who are the best candidates for Rhinoplasty? A: Most commonly, the best candidate for a rhinoplasty is someone who doesn't like the way their nose looks and has been troubled by one or more of its features. Often this is a nose that appears too large, or droops, or has a prominent bump on top. Others seek treatment after an injury, or when they develop trouble breathing through the nose. Q: What is the best age for Rhinoplasty? A: Most 13-year-old girls and 15-year-old boys are old enough physically for a rhinoplasty–that is, the nose is adult size. However, a patient’s emotional maturity also plays a role in timing a rhinoplasty. Teens and young adults need to approach this procedure for what it is: a better nose. For elderly patient's, there is no predetermined cutoff age for having rhinoplasty. An elderly adult in good health may be perfectly fit to have the procedure. There have been cases of patient's 70 - 80 years old having a Rhinoplasty performed with minimal to no complications. The ideal age range for Rhinoplasty are patients aged 20 - 40 years old, during this time your facial skin is still mostly elastic and can accommodate surgical procedures without complications. Q: What is the success rate of Rhinoplasty? A: In actuality, rhinoplasty is widely regarded as the most difficult of all cosmetic procedures. Even a modest change in nasal contour requires a sophisticated understanding of nasal anatomy, precise surgical technique, and familiarity with the myriad pitfalls that can lead to potential complications. For most surgeons, near total dedication to the study and practice of this demanding operation is needed to achieve mastery. For this same reason, rhinoplasty is also perhaps the least commonly mastered of all cosmetic procedures, and naïve or misguided surgical strategies often result from under-appreciation of this exacting and complex operation. And while your local surgeon may have a justifiably stellar reputation for other types of cosmetic surgery, his or her mastery of this highly specialized operation may be far from cutting edge. Medical literature has suggested that the revision rate of Rhinoplasty or cosmetic nose surgery is between 10 and 15 percent, therefore Rhinoplasty has about an 85 to 90 percent success rate, although this could be higher if the operation is performed by board-certified plastic surgeons specializing in this procedure. A: During the procedure you will be under local or general anesthesia and won't feel any pain during that time. Slight bleeding and drainage of mucus and old blood are common for a few days after the surgery which might cause discomfort or pain at times. Because everyone heals differently, it's important to continue to be patient during your rhinoplasty recovery. It is normal to still be experiencing swelling, slight pain, bruising, and even headaches four weeks after your procedure. It's always a great idea to visit your surgeon to make sure you're healing properly during this time. Q: Will the scars from Rhinoplasty be visible and/or permanent? A: When Rhinoplasty is performed from inside the nose (Closed Rhinoplasty), there is no visible scarring at all; when an open technique is used, or when the procedure calls for the narrowing of flared nostrils (Alarplasty), the small scars on the base of the nose are usually not visible. Q: Will my breathing be affected by Rhinoplasty surgery? A: After surgery for up to one year, there will be swelling that will occur inside the nose. This often results in some minor trouble breathing early on but quickly resolves within 1-3 months. Most swelling usually resolves within 6 weeks after surgery, but can last up to one year. During recovery, you can treat the swelling that may occur with ice or ice packs. This will help relieve inflammation and may help if you are experiencing any problems breathing. As internal swelling resolves the internal space becomes more open and breathing becomes much better. Q: Does the nose become more vulnerable after a Rhinoplasty? A: The nasal bones regain their strength by about six weeks post-rhinoplasty. After six weeks or so, the nose should be able to sustain an injury in the same fashion as it did before your procedure. The only caveat is in rhinoplasty cases were significant amounts of cartilage has been removed from the lower part of the septum. In such cases, the lower part of the nose may become slightly weaker. Q: What is the best time of year for a Rhinoplasty? A: Winter - December thru March - Universally, this is an ideal time to undergo just about any type of cosmetic surgery, from Rhinoplasty to Liposuction. Cooler weather allows bulkier clothing to conceal swelling and bruising and keeps the body in a state of healing. During winter there are more holidays as well, so you don't have to take as much time off of work for recovery. Q: What can I expect during my Rhinoplasty consultation? A: In a rhinoplasty consultation, the surgeon examines the inside and outside of the nose. The bones, cartilage, and breathing are evaluated. Digital photographs are taken and then viewed on a computer. The surgeon will ask the patient what he or she does not like about their nose. The images on the computer will be manipulated, in an attempt to create a better-looking nose. If the surgeon and patient cannot agree on what the nose should look like through computer simulations, it is unlikely that he or she will be pleased with the ultimate outcome. If the surgeon and patient do agree on what the nose should look like, an operative plan is designed. Q: What should I bring to my first Rhinoplasty consultation? A:1: A list of questions you may have for the surgeon, it could be about the surgery itself or about his experience with rhinoplasty surgery or accreditations. 2: List of medications and medical history for reference. 3: Some rhinoplasty photos to provide an idea of what you want or don't want. Q: What questions should I ask my surgeon before my Rhinoplasty? A:1: What made you decide to become a cosmetic surgeon? How long have you been practicing as a cosmetic surgeon? Q: What should I do before my Rhinoplasty? A:Stop Taking Aspirin - It is important to discontinue the use of any aspirin, ibuprofen, vitamin E, and herbal supplements two weeks before and two weeks after your rhinoplasty surgery. Aspirin is a non steroidal anti-inflammatory drug, which affects platelet function. Despite platelet count being correct they do not function correctly. The process of regeneration usually takes two weeks for the bone marrow to generate new platelets to replace the affected platelets. Q: What should I eat and drink before my Rhinoplasty? A: What you eat before surgery is important. You want to aim for a nutritious, balanced diet in the weeks before and after your procedure. If you don’t already eat a lot of vegetables and fruits each day, increase the amount you eat, so that you’re eating some sort of produce at each meal. Q: What supplies should I get before my Rhinoplasty? A: Stock up on ice packs or freeze ice cubes, then transfer them into zip-top bags so that you have plenty of ice ready to apply to the site, to reduce and keep swelling down. lip balm is crucial, you're going to have dry mouth, and lips like you've never had before. You're going to want a thermometer to keep tabs on your temp. If you start getting chills, you need to check if you have a fever and, if so, report it to your doctor right away. Q: Can I still smoke before my Rhinoplasty? A: It is highly recommended that all smoking be stopped at least 2 weeks before your Rhinoplasty procedure. Carbon monoxide introduced during smoking affects our tissue and the nicotine found in tobacco products can cause blood vessels to restrict, limiting the amount of oxygen that can get to the rest of our body. Because of these very serious complications, some plastic surgeons will refuse to perform surgery on patients who smoke. Others will require patients to commit to giving up smoking for several weeks prior to surgery. Q: What is the difference between open and closed Rhinoplasty? A: Perhaps one of the most confusing dilemmas confronting the prospective rhinoplasty patient is the choice of open versus closed rhinoplasty. These terms, while puzzling, simply refer to the two possible surgical approaches — that is, the access method used to temporarily remove the nasal skin and facilitate exposure of the skeletal framework. Q: How long does a typical Rhinoplasty take to perform? A: It depends on the extent of the changes being made to the nose. Minimal changes will generally take 1 to 1.5 hours. If there are more extensive changes taking place, then the surgery could last between 2 to 4 hours. Q: What types of Anesthesia are used during a Rhinoplasty? A: Local Anesthesia - Regardless of which type of anesthesia is selected, rhinoplasty is always performed with local anesthesia (lidocaine mixed with epinephrine) to directly numb the nose and reduce the amount of bleeding encountered during surgery. Except for very minor revisions few surgeons use local anesthesia alone due to the discomfort associated with the injection and the difficulty performing a complex operation on a fully awake patient. Q: Where is a Rhinoplasty typically performed? A: Most Rhinoplasties are performed in your surgeons office-based surgical facility that should be fully accredited by the American Association for Accreditation of Ambulatory Surgery Facilities (AAAASF) or, if they don't have their own surgical facility, your surgeon should have the ability to perform surgery at an accredited hospitals nearest to them where they can operate in a safe and comfortable environment. Q: What are the side effects of Rhinoplasty? A: Pain - Because Rhinoplasty requires extensive alterations of nasal bone and cartilage, patients may experience pain or discomfort following the procedure. Fortunately, this discomfort is usually minor and most patients find that over-the-counter analgesics are enough to manage this pain. For patients who are particularly sensitive to pain, your rhinoplasty surgeon may be able to prescribe stronger pain medication. Q: What are the risks and complications with Rhinoplasty? A: Some of the potential risks include anaesthesia risks, bleeding and haematoma (requiring return to the operating theatre), unfavourable scarring (potentially requiring scar treatment or scar revision), swelling (that may persist for many months), infection, delayed wound healing, asymmetry, pain, altered sensation to the nose, altered sense of smell, rupture of surface vessels of the nose, altered breathing, change in the quality of sounds when singing and speaking, septal perforation, irregularities in the contour of the nose, suture extrusion, potential for revisionary surgery and general complications such as a heart attack and pulmonary embolism (blood clot in the lungs). Q: Is nasal packing needed after a Rhinoplasty? A: Packing is placed whenever septal work is performed to apply pressure and reduce the post-op risk of hemorrhage. If your Rhinoplasty does not have a concurrent septoplasty then packing is not necessary is that situation. Q: Can I drive home after my Rhinoplasty? A: You definitely cannot drive yourself after rhinoplasty. You have to have someone drive you home and stay with you the first 24 hours after your rhinoplasty mostly due to anesthesia but also due to the rhinoplasty itself. Alternatively you can choose to stay overnight at the hospital if possible and have the nurses take care of you. Q: What can I eat and drink after my Rhinoplasty? A: Soft Foods - You might be a bit hungry after you get home from surgery, or even right after the anesthesia or sedative wears off. Soft foods that are somewhat mild or bland are usually ideal right after surgery. Reach for the yogurt, oatmeal or not-to-hot soup. Depending on how nauseated you feel, you may want to stick with clear liquids right after surgery, just in case eating makes you throw up. Continue with the diet of soft foods for a few days after surgery, or until you feel well enough to add different textures to your diet. Q: How should I sleep after my Rhinoplasty? A: 35 - 40 Degree Angle - After having rhinoplasty, to minimize swelling, it’s best if your head and nose are above the heart – at least for awhile after surgery. Ideally, if you have a reclining chair, it would be best to sleep in it for about a week after surgery. Failing that you could use a few pillows to prop up your head. Sleeping in a midline position will not only reduce swelling but nasal congestion making it easier for you to fall asleep. Q: Can I exercise after a Rhinoplasty? A: It's recommended that patients wait 2 weeks before going back to heavy exercise, head-down yoga positions, or generally any activity that is likely to get the heart racing and push blood flow up into the face. Light activity like walking is fine and so is intimacy so long as you go a bit easy and avoid smacking your nose! For any activity that involves prolonged submersion in water, major pressure changes such as diving, or potential contact to the nose, you generally should wait about a month to six weeks. Q: When can I go back to work after my Rhinoplasty? A: If you have a nonphysical sedentary occupation you can literally return to work after a few days. However, you would be still be bandaged and bruised. Most patients wait till the bandaging is removed to venture out of home. That usually occurs no later then one week after surgery. However, even after a week there is residual bruising in many cases. If you do not want your coworkers to see you bruised you might have to hide for as many as 2 weeks after surgery. Q: When can I fly after a Rhinoplasty? A: A patient must not fly for at least 5 days after the surgery. While unlikely, the possibility that you will have a nose bleed during the flight, which could be an emergency situation, is avoided. It is still not recommended to fly for an additional week (in total 2 weeks), but many patients cannot stay in town for that long of a period. If you must fly during the second week of your recovery, it is important to take Sudafed and spray a nasal decongestant (Afrin or other) prior to take off. If not, the pressure changes during the flight may be very painful. It is also typical to have renewed swelling after the flight, which will last about 1-2 days. Q: When will I see the final results of my Rhinoplasty? A: Bruising and swelling are a normal part of rhinoplasty recovery. They are dependent on several factors related to both the surgical technique and the patient. Techniques that increase bruising and swelling include whether or not the nasal bones were broken (osteotomies), the extent of soft tissue dissection/elevation from the bony-cartilaginous framework, and whether the surgery was performed open or closed. Q: How long should I wait after my Rhinoplasty before I get a Revision Rhinoplasty? A: In general, most rhinoplasty surgeons prefer to wait for one year before performing a revision rhinoplasty because it can take as long as a year for the swelling to subside and for scar tissue to mature. Often, some problems after rhinoplasty will resolve with time and a revision can be avoided. Other times, waiting a full year may allow for other problems that are not readily apparent in the early healing phase to become visible and all of the problems can be addressed with a single surgery.